It’s almost a dream come true– well since we moved into this two bedroom apartment. I never cared much for decor or keeping things looking crisp as if it came from a magazine page or a pinterest pin. That was until my clothing rack fell apart, not once, not twice, more like four times and I struggled to pin them back up. Then I had clothes laying all over my room which made me depressed every time I walked in that room. We finally lit some fire under our butts and decided to get bigger closets for both us because those 2×2 foot closets they stick in New York City apartments don’t suffice. I’ll give you all the deets with photos, BUT also I have a video so you can see it up close and personal! We knew we had to go Ikea because we’re obsessed with the amount of versatility they have and they had the ability to build your own closet however YOU please. Sort-of like Ikea works for you, you just have to chunk over the change. 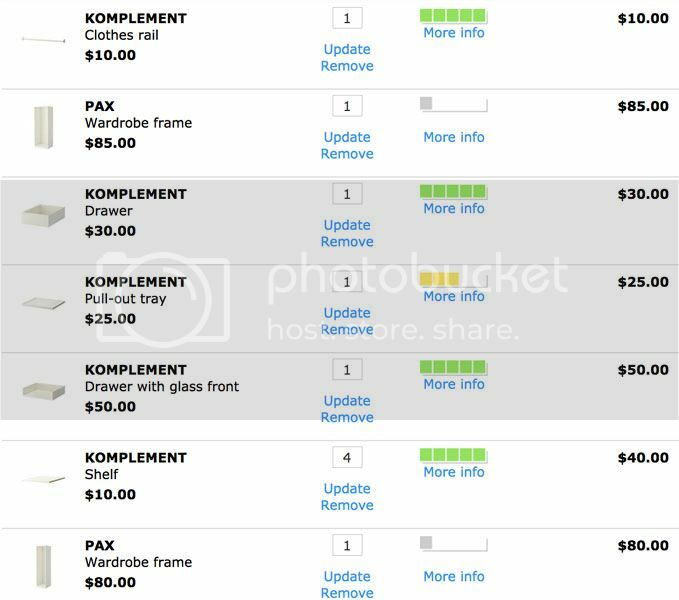 Ikea has pre-made, I guess you would say, but if you don’t like or want what they have you can design your own with their PAX storage planner where you can adjust the room they give you to your bedroom in order to give you a better idea of what your customized closest will look like in your actual bedroom. 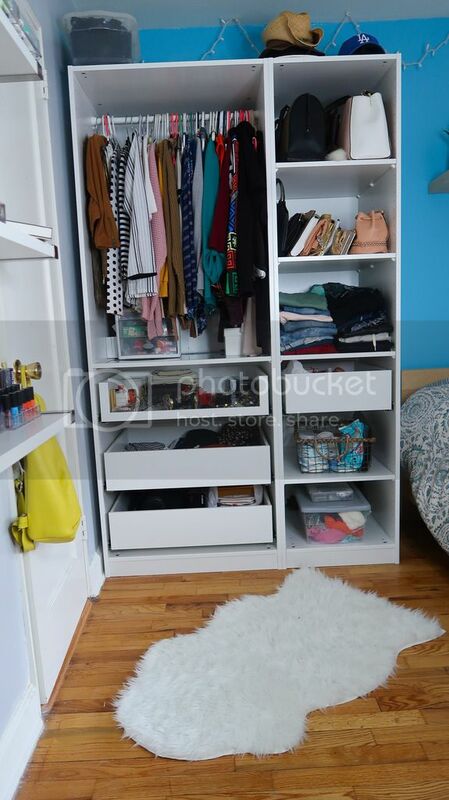 We decided to not get doors on our “walk-out” closets and make our items shine through with an open concept. With that we knew we had to be very strict on keeping the clothing, bags, whatever we put up in the closet, neat and presentable. I decided on getting the glass shelf and glass table top because I felt it would be a bit more girly and pretty to see all my girly and pretty things; sunglasses, perfume bottles, head pieces. That pretty space was originally going to hold makeup, but since I decided on getting specific shelves for that I went a different route. Two drawers were perfectly fine for me since I’m more of a ‘hanger girl’ then waste my time on folding clothing and getting wrinkles. 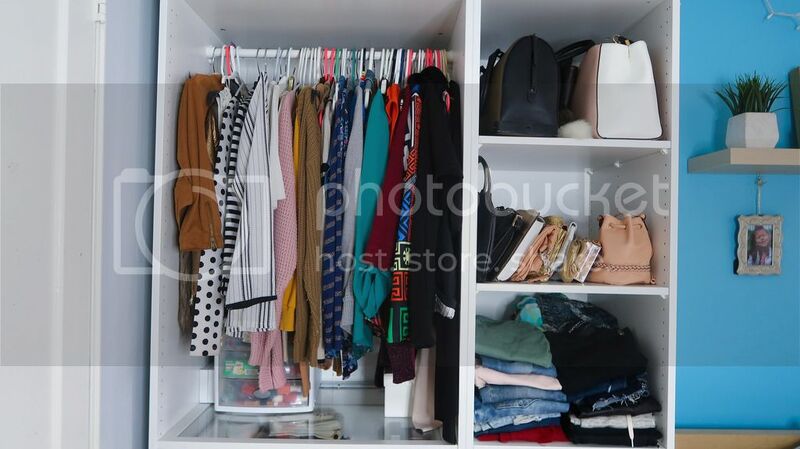 Another great feature of my closet was that on top there is ample space on top of the closet unit to add extra things you may have laying around. 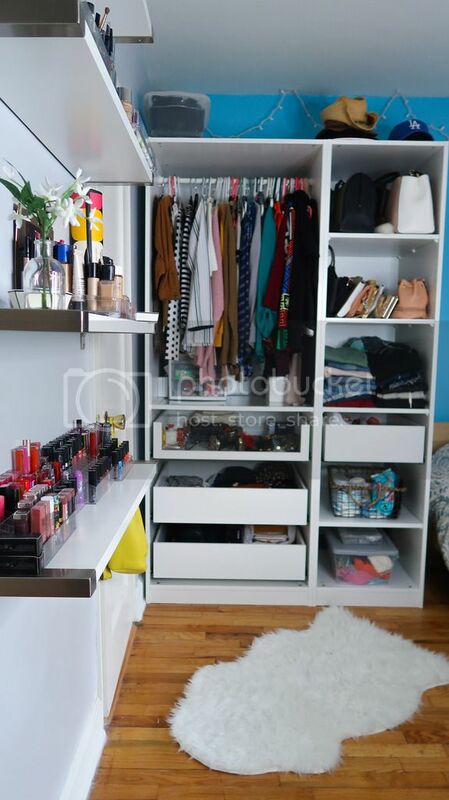 However, I wouldn’t put anything heavy because you never know how much the closet can actually sustain. 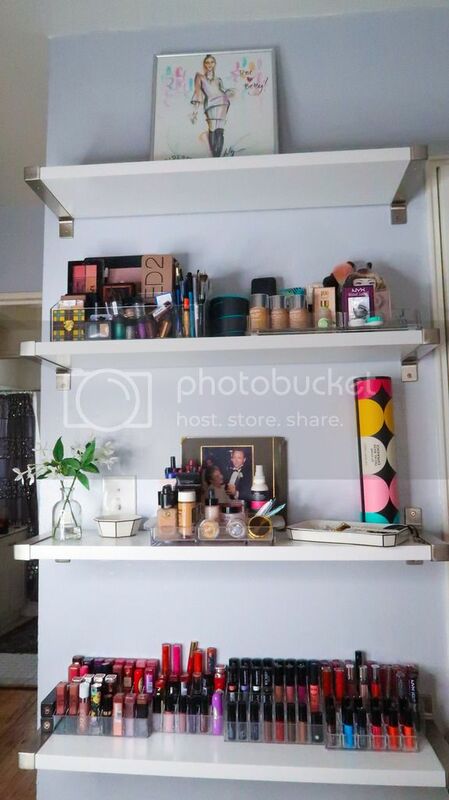 After our closets were up, next up was putting up shelves for my “makeups” (as my 4-year-old says). We originally wanted floating white shelves that were 10 inches deep and 31 inches long, but Ikea doesn’t sell them anymore. We looked on Home Depot and Amazon, but they also didn’t carry my necessary measurements or were beyond too expensive. We ended up getting the EKBY JÄRPEN shelving with aluminum bracket covers. It wasn’t my ideal, but thankfully it matched the bedroom decor. 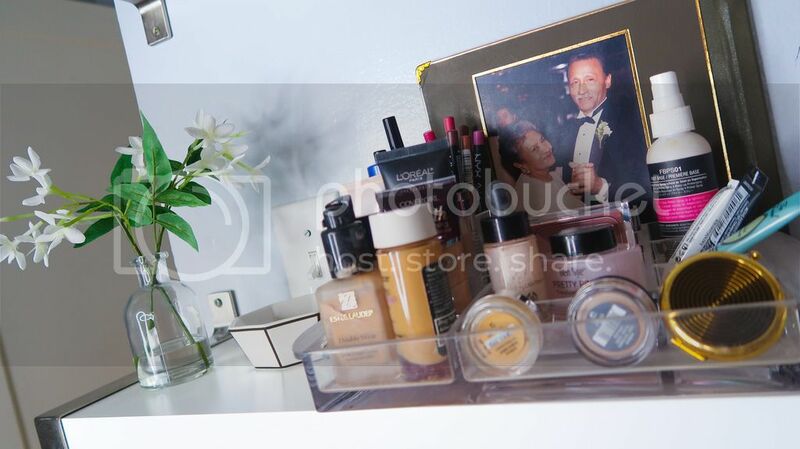 Four shelves later and all my makeups have a place to stay– neatly. 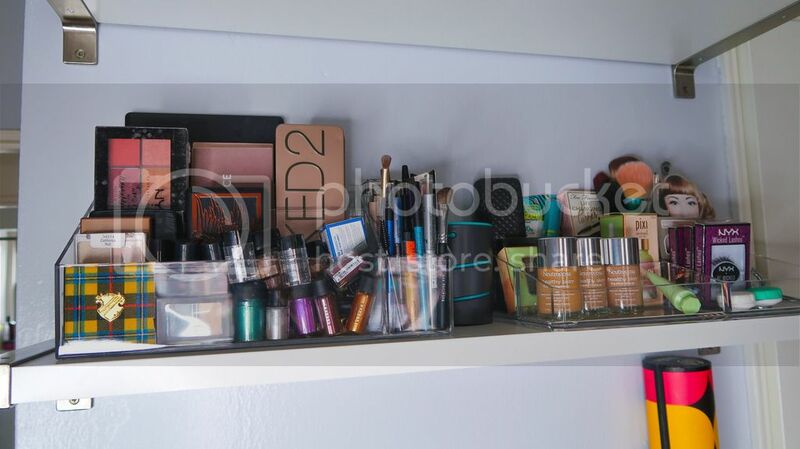 After the shelves went up it was time to go through the endless amount of makeup I owned– some I never knew I had, because they use to be shoved in a draw and some expired. I needed to get makeup cases. A few I had before this whole renovation and others I had to buy from amazon. 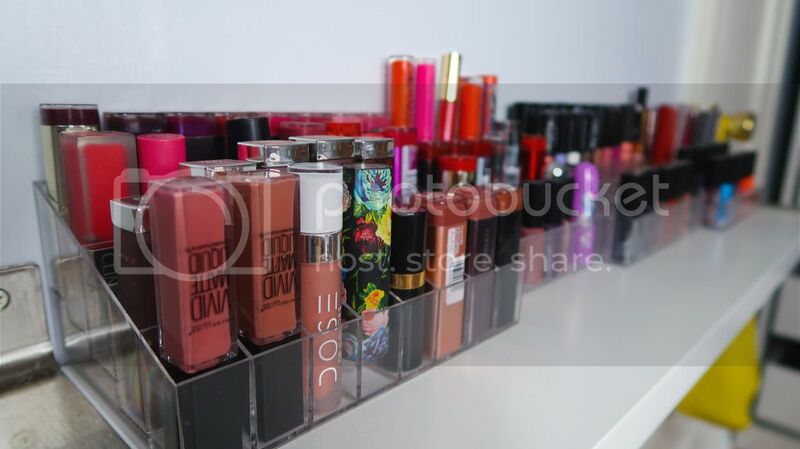 Two 40 Lipstick Organizers, 1 Lipgloss Organizer, 1 Grid Organizer, 1 Palette Organizer. To add a bit of fashionable style to my corner of the room I put those cute white fur floor rugs you see everywhere– TEJN. Anyone know where they come up with these names?